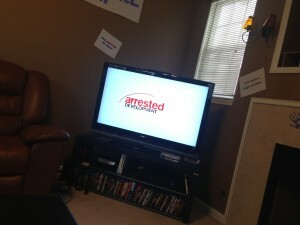 As I discussed in a previous post, on Memorial Day we hosted an Arrested Development party to watch the entire new season of the show. I started watching Arrested Development during their third season and later dived into the DVD’s and fell in love with the show. Known for it’s national cult following, the series has probably surpassed that with my immediate group of friends. 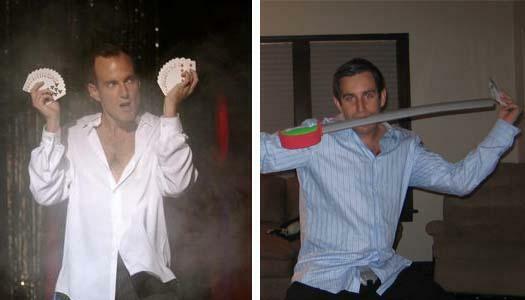 So much so, that we threw an Arrested Development themed Halloween party in 2007. To say we are super-fans is probably a good classification. For the uninitiated, Arrested Development is a wacky single-cam style sitcom about the Bluth family. The Bluths, to say the least, are dysfunctional. The show is known not only for it’s smart humor, but it’s layered subtle jokes and “meta” references to life outside of the fictional world of the show. The series met a far-too-early end but has become my most recommended must-see. After a lot of pressure from fans, Netflix financed a new season and released all the new episodes over Memorial Day weekend. My friends and I have been counting down the days for the show to launch and we were not disappointed. The fourth season has a slightly different structure than the original episodes. Since there were scheduling problems, not all of the cast could be together all of the time. The work-around by the writers was to have each episode focus on one character so the interactions with the entire cast could be a little more controlled. The result is 15 episodes that all take place from the moments after the season three finale to today. The episodes are weaved together so you see the same event from different characters’ perspectives. So what might seem like a random event is later revealed to be caused by the actions of another family member. Jokes are setup and then delivered in later episodes. The entire structure makes this just as, if not more, rewatchable than the original series. There were a number of call backs to earlier jokes while working in new running jokes. The new episodes were slammed by a lot of critics, but I think they missed the point. If you are a fan of the show, you loved these episodes. It was fantastic to welcome the Bluths back and I greatly look forward to watching the episodes again… and again… and again. Let’s just hope there’s a Season 5 or a much talked about movie. When you mentioned &quAo;tfrican Stew" it hit me. That will be my winter cooking obsession. It can be made very healthy and has peanut butter in it. What can be better.